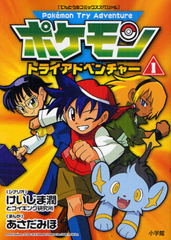 Pokémon Try Adventure is a manga illustrated by Miho Asada (author of Pokémon Get Da Ze!, Try Adventure and Phantom Thief Pokémon 7) and written by Jun Keijima and Koiking Laboratory. 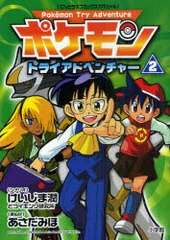 The manga was published on CoroCoro Comics from 2010 to 2011 in three volumes. 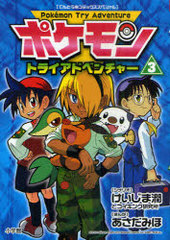 The manga follows the adventures of three people and their Pokémon: Katsuya: a genius of Pokémon battles who wants to be stronger, Soro a Pokémon collector and Toki a survival expert. The three of them accept missions, challenges, resolving mysteries and help people and Pokémon. Chapter 7: Protect the Harmony of the Forest! Chapter 12: Who's the Best? Chapter 18: Caty's Big Chance!? Chapter 26: Clue to Cresselia! Chapter 32: Tough!? The Flower's Nectar! Chapter 33: Moonlit Treasure Hunt! Chapter 35: An Unfamiliar Combo Play! Chapter 38: Open the Mysterious Box! Chapter 43: Eager Beaver Oshawott!! Chapter 44: Showdown! The Black-White Demon King!! Chapter 45: The Demon King's Explosive Power! Chapter 46: Go For It, Manami! Chapter 47: The Final Battle! !